This falls into my category of Brilliant Idea Executed Poorly. I have always had wicked vivid dreams, so novels about dreamscapes, dreams vs reality, dreams portending the future, etc, fascinate me. "Black" intrigued me enough that I forced myself to read six or seven chapters, then I was so irritated that I ranted about it to my poor husband for 20-30 minutes. What didn't I like? Characters who are at once both ridiculously unbelievable AND flat (our protagonist can't focus long enough to maintain a steady job, but is a karate prodigy. He's dependable enough to financially support his mother & nurse sister, but blew tens of thousands of dollars smuggling crocodile skins in exotic Asian statues rather than paying off the NY Mob loan shark. The apt he shares with his sister is full of said statuary and masks because his import/export business didn't work out. Hey pal, I have one word for you: Ebay. Frickin' idiot). The action reads like a poorly designed video game, the dialogue is clunky and unnatural, and the fantasy/future reality is like a bad episode of He-Man & the Masters of the Universe. When the giant white bats started talking like Jewish grannies at the corner deli, I had to either return the book or be put on suicide watch. 3.5 starsI love the concept of this book. It’s one of the most unique books I’ve read in awhile. But it was not without faults. The characterization was kinda bad in the beginning, sometimes the writing was a little eye-rolly, the situations a little too convenient. Despite the faults, I just couldn’t put it down. In fact, I started on the second book immediately after finishing (which is something I almost never do). Someone is shooting at Thomas Hunter. He runs for his life—zig-zagging, hiding, and executing some awesome martial arts—as men chase him through the streets of Denver. But when a silent bullet grazes his head, his world goes black and he wakes up somewhere else. In darkness. He doesn’t know where he is. Hideous bats chase him, clawing at him until he loses consciousness again and wakes up back in Denver, in an alley. He manages to get to his sister’s apartment, clean himself up, and lies down on the couch.Only to wake up in the strange place again. He finds his way out of the scary, dark place and into a perfect land, somewhere in the distant future. He meets kind people who embrace him, a beautiful woman, and embarks on an amazing adventure.But still, every time he falls asleep in one world, he wakes up in the other. And as the stories weave together, Thomas discovers that the past, and his life in Denver, was destroyed by a deadly virus. He wakes in Denver and enlists the help of his very skeptical sister. The two set off to save the world, with Thomas traveling back and forth looking for clues and trying to convince everyone of his sanity.Woo! What an amazing book. From page one, Black, by Ted Dekker, captivates, taking the reader on a journey of cunning wonder. It’s no surprise of this trilogy is such a huge success. The book ends on a cliffhanger, leaving the reader one his own adventure: off to buy book two. Nice job!Highly Recommended. *SCREAMING FROM THE ABYSS AS I SLOWLY SET THIS BOOK DOWN* AHHHH. AHHH. SORRY. ANYWAY. COHERENT THOUGHTS AND STUFF. This book was absolutely amazing. It made me laugh, made me mad, surprised me, got me thinking, and wonderfully showed a side of Elyon that I really needed in my life lately. Jaw-dropping book. Black has been on my to-read list for almost as long as I have been on Goodreads.A couple of weeks ago, totally out of the blue, my girlfriend asked me about the series and if I had read it. She had somehow stumbled across it, which is odd because genres of the fantastic aren't usually her thing (although I have been feeding her some of Stephen King's greats, and she's loved them, so I guess all bets are off now).Anyways, I told her I hadn't read it but it had been on my list for years. She loaded it onto her Kindle and burned through it. Then she downloaded the next two and burned through them.I told a colleague about this, and so he got Black and also burned through it.Okay, I was getting excited and moved this way up to my next-to-read.I started reading it and was really digging it. I've now finished it, and while I really enjoyed the book and how the story was alternating between our world and Thomas' dream world (and wondering which was really the dream world! ), I will not be continuing the series.Why? Well, although the GF did enjoy the whole series, she did show signs of tiring through the second book. Too many battles, she said. And I hate reading battles. And, my colleague couldn't take Thomas' crying any more in the third book, and did not finish it.These are two people's opinions who I greatly value and respect, and their warnings are good enough for me. Besides, I've yet to find any series, no matter how riveting, that does not become long in the tooth after a thousand pages.So, not much of a review on the content, eh? Okay, take this: this is a very well done novel. Dekker's pacing is impeccable and it makes for a lightning fast read. He keeps the unknown dangling in front of you and this keeps leading you headlong through the pages. Definitely approaching five star worthiness, but I am frustrated that this is a story that needs another two books to tell it. Heck, I loved The Hunger Games, but that would have been even better if she had tidied things up in book two. So you know where I'm coming from here.One last gripe: the Kindle edition had issues with the font occasionally morphing to a squashed format that had me wondering if I was having a stroke.Not cool. Ted Dekker is supposed to be a pretty good writer. I would not assent to that proposition based on this book. Based on the high ratings and good reviews of this work on Amazon.com, I had hoped this would be a good introduction to the author and a fun, but challenging, read. I could barely finish it.The one thing Mr. Dekker does well here is create two distinct worlds and keep the protagonist and the reader wondering which one is real. Is it the world that seems to be our own, with all of its wars, disease and crime? Or is it the land the protagonist visits when he is sleeping (or in a coma), where evil is decidedly black and good is innocent and naive?The problem is that I don't care. The fantasy world is not rich enough and things are too black and white. The allegory is both too obvious and too dense to penetrate. I'm not sure what the author is trying to show. Events in the real world are either too coincidental or too dependent on an almost omniscient and omnipotent antagonist. No one has that kind of power and insight. And the protagonist is too laid back for a novel. Things just happen to him, even when he's trying to be a bit assertive. I made it all the way to the end of the book, looking for something to really happen or be explained. It never was. And I don't care enough about it to pick up the other two books and spend the hours needed to read them. I would highly recommend this book to anyone I know. This was written about the Chronicles of Narnia on wikipedia.org but applies to the Color Trilogy as well: "The series contains many allusions to traditional Christian ideas,... however, the books can also be read purely for their adventure, colour, and richness of ideas." Even if you are not a Christian, I believe you will enjoy this book because it IS a metaphor. In fact, even as a Christian, I didn't understand what the metaphor was until the end of the book! There is no preaching, if you have a Biblical world-view you will just have a deeper appreciation for the story and Dekker's amazing writing.Although I have been a Christian my entire life and have read the Bible cover to cover, I was surprised when I finally understood the plot-line of this book. I actually wept as I understood Christian truths in a fresh and impactful way. The Circle series is a great read. For a religious writer, he's not preachy. Love the fantasy world, love the main characters, and love how long the series is as ONE big story that intertwines with his other book series.Read them all. Reserving final judgment until I complete the trilogy...this was just window dressing to me. I tried to read this book once before, and just couldn't get into it. I put it down, didn't try to review it, didn't comment, I just hadn't gotten into it. BUT, I have friend to whom this is an important book, so I set out to read it again. My take on it is that it could have been a much better book than it is.Throughout this book I'd say that my estimation of it's rating moved from 2 to 4 stars. It took me FOREVER to care about the characters. I know I should have. I know I was meant to...but it just rambled on. the set up on the 2 worlds within which the action takes place just seemed to stumble along and worse, at times was silly.In the end there were parts that really started to catch my interest and draw me in. They were a sort of come and go affair and I wish the book had been done better, still, I plan to find Red and follow the series. In the end I split the difference between very good and poor and went with 3 stars. be aware that it does start (in my opinion) slowly.Okay below there will be a couple of minor spoilers, so if you don't want to find out anything don't read beyond the line. I don't plan to spill a lot, but to discuss why I rate the book as I do I need to reference a couple of things in the book. (view spoiler)[The set-up for this book has to do with Thomas "flitting" back and forth between 2 worlds that are apparently the present and "a" future or maybe "a possible" future. This seems to happen in dreams as when he's asleep in one place he's awake in the other. The time he sleeps apparently doesn't have any effect on how long he actually stays one place or the other. One of the "key movers" in the story has to do with Thomas finding that "The Histories" in the "future world" tell of a plague that springs from the work of a pharmaceutical company" in the present and wiping out the vast majority of humanity. He decides he's supposed to stop it. So....In the future world, Tom was met by a "race of giant bats". The evil ones are in a burned forest and the good ones (far fewer in number) live across a river. The dark bats are not allowed to or cannot cross this river across which the humans, who are descendants (apparently) of the few humans who survived live in a beautiful "colorful land (more than just green, vegetation of all colors abounds). The "good" giant white fuzzy bats, explain to Tom about the histories and the plague. So...what does Thomas do? Does he call the CDC and claim to be a whistle blower from the pharmaceutical company and warm them that the new "air born" vaccine will mutate into a world girdling plague? Does he claim to be a whistle blower and just warn the CDC that there is a problem with the vaccine and it's dangerous and should be looked at? Does he do any of a dozen things that might get the attention of the CDC or a government or the medical community?No...he goes to the CDC. I mean walks into the office...at 4:30 when the offices are closing, pretends to be chocking and makes a scene so "he will get their attention" and get to talk to someone. Then he informs the CDC that a giant fuzzy white talking bat warned him in a dream about the vaccine.Right.It doesn't even work for me within the story...he'd have been carted off when he started his chocking scene. Any half sane person would have had an inkling that talking about dream revelations from giant talking bats (fuzzy or not) wouldn't exactly bring anyone on line to help. The interaction with the man he's talking to is painted as far more civil than I think it could have beenThe book is thick with this kind of thing. It didn't draw me in till it was maybe two thirds of the way through and even then the way Dekker wrote personal interaction would almost lose me. (hide spoiler)]I am by the way a Christian and I know this is a much loved book among many Christians. I have great concerns with it, and wish it could have been better. I hope the series gets better. Si bien el libro maneja conceptos geniales y me agrada el estilo del autor, la historia se volvió demasiado reiterativa y me estanqué de una forma horrible. No poder avanzar con este y que sea una serie, no me entusiasma a concluirlo. Probablemente sea forzarme a terminarlo para nada, ya que dudo que la historia termine en este tomo, y no sé si quiero leer los demás libros cuando ni siquiera me siento capaz de leer este hasta el final.De momento, lo abandono. Ted Dekker is a magician when it comes to creating a book this astounding, this addictive, and this breathtaking. It held a strong grip on me and has left me spellbound from the beginning to the very end. There is no relief at the last page; instead it left me begging for more. The story ends on a high note and only promises a more delectable part 2 that I can't wait to read.The book starts innocently enough; Thomas is on his way back home in Denver when a shooting brings him down into another reality. A bullet that grazes his head opens a portal to an alternate world, more magical and enticing than his ours has ever been. This prohibits him from sleeping when he goes to bed; instead he wakes up in a black forest inhabited by black bats with strong wings and with magic water that would give him some unforeseen knowledge and power. It seems to mirror his own world in more mysterious ways that he can imagine. A great plague is about to be unleashed and he must use his wild dreams to find a solution and salvation on Earth, his mother planet and all its unaware inhabitants. Unable to choose which world is really real, the lush green forests with and opposite black side or the threat of biological warfare that is somehow timed to him, Thomas must suspend his entire knowledge of science and reality and swim into an unknown world that somehow knows him.What is real and what is fiction, who amongst the characters is God and who is really evil? Ted Dekker takes an enormous plunge with this novel and delivers something that is beyond reading, this book shook me to the core and left me panting for more, wonderful, strong and fast and well thought out. The Circle trilogy starts of strong, with the creatures of the black forest and the inhabitants of the colored ones that only seem to exist in dreams, but they know about life and death to the point where Thomas starts to doubt humanity and it's existence, is it all a dream? Part of the book seems like folklore and others are very depend on those imaginary parts, this tale is a fantastic ride for those who love to read.Very profound and thought invoking this book is a force greater than I can describe, it simply has to be experienced! Ted Dekker should be on top of everyone's list, his books reach into the subconscious lever and bring out the questions and fears that force us to look deep into the limits of our minds and space; it forces us to acknowledge the infinite possibilities of what life really is all about. This book is the first chapter in a whole set of tales so out of this world that they are almost indescribable. This is what reading is all about, juicy stories with non-stop adrenaline pumped action. I first read this all the way back in 2006, and it still holds up today. An exciting, fantastical thrill ride that grips you, this is a wonderful book. Even though I've read them before, I can't wait to try Red and White again! This book was part of a survey class and as such, I was looking forward to it. I've liked reading books from different genres and discovering the different types of appeals they have for their selected audience and myself. This book was my least favorite of the entire class.To begin with, the story's premise slowly introduced and never fully explained. Tom is waking up in two different worlds in two separate times; ours and an Eden-like place in the future which is, for all intents and purposes, perfect. No real reason behind this is given, though it's hinted that Elyon (God) has some kind of purpose for this. Changes are mirrored between the worlds and it falls to Tom to prevent the destruction of both by learning about and interacting with both worlds.The books writing was a huge problem for me. The story and pacing of the book are EXTREMELY slow and this made it difficult for me to get caught up in the action when it does happen. All of the characters in this story felt really one-dimensional and I didn't really empathize with the lead, much less anyone else. The dialogue also feels horribly stilted/cheesy at times, making it hard for me to really sink into the story. This one-dimensionality holds true with other plot concepts like the "Great Romance"; I understand it's importance but there's no description of its appeal (and why I as a reader should desire it) and I don't really care about it. The premise is just really frustrating since NO ONE in either world believes Tom for the majority of the book until something horrible happens. Meanwhile, all Tom does is lament that one believes him despite his proof and he's forced to wait until ALL those around him see the error of their ways. Not a lot happens in this book in terms of larger plot development and combined with the lack of character development, the story falls flat.The major flaw of the book, though, is its failure to successfully mix genres. Instead of sticking to one, Dekker attempts to mix his Christian allegory with romance, science-fiction, and bio-thriller. He succeeds with none and the story feels like one giant mess. The book also ends in a cliffhanger, without any of the major plot points or questioned resolved. While series books should have larger arcs, individual titles require that at least part of the stand-alone have some resolution; this didn't have enough for me.I can understand why this book has such a strong appeal; it reflects a strong Christian worldview and allows the reader to engage in a story that possesses the same outlook and framework they do. Dekker does a good job of displaying the relationship between God and man and the love and communication that can exist between them when is man is open to it. Overall, the story attempts to explain the Fall to modern audience and how man has a chance to be redeemed if we can remember God and hold onto Him. This book is tough for me to write about. There are elements I liked and elements I didn't. His writing style is easy to engage with and is compelling, but it is the first half-fantasy, half-mainstream fiction I've ever read. I don't really know what to say. Yes. I do. This book is intriguing because Ted Dekker has taken an idea and catapulted it into a whole other spectrum of writing. I can see why he is so well loved and has done so well. The story is about a man who finds himself living in two worlds - the "real" world (aka - the mainstream fiction writing) and a "dream" world (aka - definitely fantasy genre). He passes back and forth between these two worlds, never knowing which one is the real one, but the author has a definite agenda in where he wants to go with his writing. This is a Christian Fiction book and at first look, I would never have known. However, as the book progresses, the connection to Christianity becomes increasingly clear and what Dekker feels he wants the message of this book to convey. This book is also part of a four-part Circle series - four books that begin and end with the same book. You can read any one of them and go around the circle and they will end where it began. I have not tried this, although I do have the next in line - Red - and I am undecided if I would like to go the circular distance. There was enough about the way the fantasy particulars were written that did not keep me interested to make me unsure if I am willing to venture into the next one. We'll have to see. I've listed this as Christian fiction, but it really doesn't fall in that category. I'll give this some thought and maybe come up with a new shelf. I did enjoy this book and would have given it 4 stars except for some parts that I found a bit boring and a little ridiculous ... even for this type of story. The pseudo Garden of Eden was a bit hard to take at times ... at least for me. At one point I though these must be the bad guys because they are just too good to be true. Since this is the first in a trilogy, I'm reserving judgement for the time being. I did not care for his rendering of God. Must be my Baptist upbringing. Anyway, enough of that. The story was exciting and the last 100 pages (1/4 of the book) kept me awake most of the night. The story begins with Tom being chased and shot at. His head is grazed by a bullet and he loses conciousness. When he comes to he is in a totally different reality. Each time he falls asleep or loses conciousness, he wakes up in the other place to the point that he doesn't know which reality is real and which is a dream. It is also a "world is coming to an end" story and Tom is the only one who knows and he has to convince others. This part of the story is very exciting and well written. It has a great cliff-hanger ending and I could start the next book right now. A solid 3.5 stars. I've been trying to think about what I could say about this book. And I know that's a horrible way to start off a review. I also think that it hits at the core of what could be said. Do I tell you, that as a Christian, I actually dislike a great deal of Christian books? That even though I did like this book -- that I really don't mind this series too terribly much -- that it does nothing to change my opinion of the state of Christian publishing. Should I tell you that while Ted Dekker holds true to his renown as a action-packed best-selling adrena-author persona and that this same persona undermines a potentially epic story? And that despite all of that, I'm tearing through these books like a mad man.The originality of the story -- well, to be more precise -- the concept of the trilogy is what kept me going. I had an idea of what Dekker intended, the direction he was headed, but there were parts that had me stop to think; but then of course my instincts were right. I tried to keep my expectations even keeled on this read. I knew it wasn't going to be that great but enough people who's opinions matter had enjoyed it so it couldn't be that horrible. And rather it come through as a three star, Dekker's tale rose a rank if only for his ability to describe what life before sin must have been like. The use of the water works out cleverly.I wasn't so keen on Thomas, though. Albeit, this is more of a problem I find at the root of most Christian fiction. He's a decent character for best-selling adrena-thrillers. But what I don't understand is how these protagonists who don't believe in God come waltzing onto the scene embued with any number of supernatural gifts and yet they lack any real flaws. I don't understand how Thomas can be given the inkling of a backstory in which he's clearly made a hard detour away from God, yet he can so casually put all that aside to believe in Elyon. It's weird how he jumps between realities, is so certain God is real in one and doubting in the other, and then before you know it -- he's reconciled his belief with no more than a shrug. There's no inner turmoil over what to believe, no sudden epiphany. The only hint of promise is Thomas's realization that he may have died and come back to life. But he doesn't want to think about it. He's got to save the world. There's no time to struggle. He's the hero. He accepts whatever's put in front of him and saves the day. Which is good, because I might have slowly my adrenaline induced page turning. I might have had time to process something beyond a thrill. I might have even waited to pick up the next book (had the series not been given to me as a gift). And might I ask when a trilogy came to mean that the story screeches to an abrupt halt until the next book comes out? Sorry.I really did enjoy this book. I'm currently reading "White." I have a lot to decry about the books, but it really has more to due with the style and its systemic lack of substance. But to his credit, Dekker does a great deal with what substance there is. In January I was introduced to Ted Dekker through his most recent Circle book, Green. 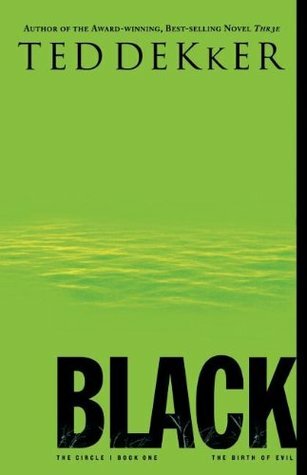 I was fascinated by Thomas Hunter and his dreams in that book and with Black I feel as if they have been taken to a whole new level.Now, Black was written before Green. And Green is meant to be read as the finale, or as the beginning - it doesn't make a difference really. I will tell you that having read Green first I was able to jump with both feet i to the story laid out in Black and my level of understanding was much higher than it might have been had I just been learning about the worlds of Thomas.In Black we're introduced to the steps that were taken to release the Raisan Virus into the world. Parallels are made between the future world and between our current world. The action is literally non-stop and there are so many things left unexplained.. argh I get all twisted up inside just thinking about them. And there is an awesome cliffhanger at the end of the book so you'd better make sure to have Red close by and ready!My one complaint about the Dekker books is that, at times, they seem almost too intense. As much as I want to pick up Red and read I feel as if I need to take a deep breath, relax a little and mentally gear myself up for another jump into the story. But, rest assured, jump I definitely will. One man, two realities, and the end of the world. Put that in a book and you'll get Ted Dekker's first book in the Circle Series.Valborg Svensson a multi-billionaire aiming for global supremacy tried to get his hands on the supreme cure for common illnesses- the Raison Vaccine. Unknown to the creator (Monique de Raison) the vaccine mutates to a deadly virus when heated at 179.47 degrees for two hours.After it mutates the supposedly cure for common ailments then becomes a highly infectious, airborne virus with a three- week incubation period, that could wipe out humanity from the face of the planet. In its viral form this could make Ebola looked like a common cold.Thought provoking, interesting love triangle, and a fast- pace- edge- of- your- seat story telling. Fans of Frank Peritti and Dean Koontz will be drooling over Dekker's books! I am soooo not sure how to talk about this book.I've had it on my radar for a while, so when my last audio book finished and all my library holds had yet to materialize I had to search for the one that was going to fill the void. There is nothing worse on a commute to have to resort to the radio when you've spent years immersed in books. The thought is enough to send me over the edge! So finding this book immediately available, I took the plunge.Well - it filled the void, but ....... But. ........That word but. It speaks to my hesitancy. It was a book with some issues I thought, but with an interesting premise ...... so .....I soldiered on. It's a story that has these incredible switch backs - one reality to another in essence - and it really takes some time to fall into step with the story when the switch happens. I'm still not sure about it, even at the end of the book (if you can call it that), because that's my second issue. The ending. It's not. It's a conclusion of sorts - but not in any sense of the word. The initial story isn't resolved in any way, despite the fact that the book ends. Plus it ends on a complete cliff hanger - more like a tv stunt to keep the viewer enticed to come back for next season. In a book, I'm not sure if it's quite as successful as I felt more pissed off than enticed. I don't know if I'm invested in the story and the characters enough to want to go back or not.But I will return to it. I'm stubborn that way. It's not poorly written - it's a little preachy for me mind you, but Ted Dekker can write well. I really just want to see how this all resolves itself, so in that regards, it wasn't a complete wash. Just keeping my fingers crossed that the second book has a proper ending. But I'm not counting on it. From ISawLightningFall.comI don’t remember all that much about my elementary-school days. However, I do recall one art class in particular. My teacher held up a color wheel and pointed out the three primaries. Combining these in varying proportions, she explained, yielded the rest of the colors. Red and yellow made orange, yellow and blue formed green, and so on. This fascinated me, but what really blew my six-year-old mind was how she said we got black -- by combining everything. That couldn’t be right, could it? So I did what any doubtful kid would do: I dumped all my Crayolas on the desk and started wildly scribbling with each one on a fresh sheet of paper. A similar sense of unfettered experimentation marks Ted Dekker’s genre-bending novel Black.Thomas Hunter has gotten himself into a fix. It was bad enough that he borrowed two-hundred grand from the Mob under false pretenses, but the fact that he hasn’t paid it back has made matters even more tense. Fleeing from a posse of contract killers through the backstreets of Denver, Thomas gets clipped on the head by a stray bullet and passes out. When he wakes up, he isn’t in the Rocky Mountain state. Or the USA. Or anywhere on earth, as far as he can tell. Thomas finds himself in a wood black as midnight being attacked by a horde of ferocious bat-like creatures. He soon collapses from blood loss -- and is back in Denver. He quickly learns that he’ll alternate realities every time loses consciousness and that both places are in danger of destruction, one from the bats (dubbed the Shataiki) and the other from a global pandemic (soon to be caused by a virus called the Raison Strain). Only Thomas isn’t sure which location is actually real and if he’s supposed to avert the disasters -- or be their cause.Let’s admit it up front: Black is a bit of a mess. When it comes to genres, Dekker not only throws in the proverbial kitchen sink, he chucks in the bath tub, the washer and dryer, the dining room table, a chandelier, and some insulation to give things texture. In Black, you can detect a bit of (breath) the higgery-jiggery time-travel paradox of Twelve Monkeys; the viral terrors of The Hot Zone; the mythic strangeness of George MacDonald’s Lilith; the chop-socky fisticuffs from The Matrix; the spiritual allegory of C.S. Lewis’ Narnia series; the bosom-heaving passion of a Regency historical romance; the high-stakes geopolitics informing a Tom Clancy technothriller; and the perspective-bending horror of Silent Hill. Sounds awful, right? It isn’t, though. True, a lot of the novel doesn’t work. (The romantic interludes pretty much always fall flat.) But Dekker goes at it with such gusto that you can’t help reading on to see what combination he’ll try next and cheering him on when he succeeds. Black may not achieve a uniform sheen, but its palette is fun to behold. Couldn't put the book down!! I've been desperate for an original, highly engaging supernatural fiction series, and "Black" by Ted Dekker definitely delivered. The character of Thomas Hunter, was well-written, likable and believable.The allegorical-style telling of the redemption story - the beginning of it, anyway - was reminiscent of C.S. Lewis' space trilogy. Especially "Out of the Silent Planet" with Ransom. Halfway through "Black" I began to compare him to Random from C.S. Lewis' book. The story of Thomas Hunter shifting between two different worlds in his dreams was original, and the well-developed worlds and characters compelled me through the book to the very last page. The bad guys were a bit one dimensional, but the plot was brilliant. I've read several reviews that criticized the parts of the story devoted to the "Great Romance." However, I found these sections to be beautifully written. Dekker's prose was magical. Regarding the love of Elyon, symbolic of God, the character of young Johan tells Thomas: "Do you know why we love beautiful flowers? Because we love beauty! The point is, we were created to love beauty. We love beauty because Elyon loves beauty. We love song because Elyon loves song. We love love because Elyon loves love. And we love to be loved because Elyon loves to be loved. In all these ways we are like Elyon. In one way or another, everything we do it tied to this unfolding story of love between us and Elyon. "Exchanges like this between the characters made the eventual Fall of man all the more tragic toward the end of the book. What a great picture of the love of Christ for us!Also, Dekker did a fantastic job explaining the role of evil in this 'other Earth' that Thomas visited, and the need for free will in mankind. For example, see this conversation between Thomas and the God-like child mid-way through the book:"Then maybe you can tell me something else. How is it that Elyon can allow evil to exist in the black forest? Why doesn't he just destroy the Shataiki? ""Because evil provides his creation with a choice," the child said as though the concept was very simple indeed. "And because without it, there could be no love.""Love?" Tom stopped.The boy's hand slipped out of his. He turned, brow raised. "Love is independent of evil?" Tom asked. "Did I say that?" A mischievous glint filled the boy's eyes. "How can there be love without a true choice? Would you suggest a man be stripped of the capacity to love? "This was the Great Romance. To love at any cost. "What a great picture of God's unparalleled gift of free will. I highly recommend this book. This was my first Ted Dekker novel, and I've already started book two, "Red." This and many more reviews are over at Rachel Reading! Let us help you find your next read!This book came highly recommended to me by one of my closest friends, who said that when he was growing up in a pretty strict Christian household he absolutely loved this series. Even though he no longer identifies as a believer, he still maintains how much he loves these books, so I was very excited to dive in.I started this book as the audiobook, and there were very dramatic sound effects between chapters which threw me for a loop. This book follows Thomas Hunter in a kind of dual story. The first, involves a deadly virus called the Raison Strain which will decimate the planet. He embarks on a high intensity dash against time to try and warn the correct groups about what is going to happen. Although the only way he knows this, is because he found out as Thomas in a completely different reality that comes to him in a dream.One of the things I absolutely loved about this book is that you really can't figure out which of these realities is...real and which is a dream. In each reality, when that Thomas goes to sleep or is unconcious, he wakes up in the other world and remembers everything that happened in the other reality. The story is extremely fast paced, and I found it done really well. I've struggled with thrillers lately because they don't seem to move quickly enough for me.I will say, that this book is written as a Christian book, so the metaphors aren't really disguised at all. You can see plainly exactly what the author is alluding to but it didn't ruin the book for me. It came off as heavy sometimes, but overall it seemed harmless. The way Dekker describes some of the basics of Christianity is actually really interesting to me, and gave me a different perspective, and a new way of explaining things to people who ask.I wasn't sure if I was going to pick up the sequels, but I think I will. This book has actually really stuck with me surprisingly, and it strikes me a bit as a Christian Dan Brown, so if that's your jam...check this out.